Reading the Fantastic Four comics from the start. We’re going back to the ‘60s (except not) and the Avengers guest star (except they don’t) in issue #388. As with the previous issue, this one begins with the Watcher providing a recap of the story so far. This time, though, the Dark Raider is in the Watcher’s home with him. There’s a lot to unpack here. First, we’ve been told that the Dark Raider is an apocalyptic evil that teenage Franklin and his grandfather Nathaniel have come to the present to stop. Second, the Dark Raider is dressed as the Invincible Man. Remember that “Invincible Man” is not a person, but merely a name and costume worn by a variety of characters whenever they need an alternate identity. The Watcher has come to the Dark Raider to ask him to change his plans, to prevent a cataclysm. The Dark Raider refuses, saying it is his destiny. We then catch up from the last issue’s cliffhanger. After receiving a message from Sue in another timeline saying the FF are doomed, the team — currently Sue, Ben, Johnny, Ant-Man, Lyja, and guest star Namor — used the FF time sled and followed the message to its source. There, in an undefined timeline, they met the classic 1960s FF. There’s a lot of tension in the room and a fight almost breaks out, but Alt-Reed insists that more than meets the eye, and he welcomes the FF as his guests. Franklin also shows up in this timeline, easily bypassing the ‘60s Baxter Building’s security. Inside, there’s some comedy business with the two Johnnys and the two Bens showing off their powers while Ant-Man watches. Franklin telepathically convinces the Alt-Ben into thinking Ben is a Skrull, and a fight breaks out. Ant-Man shrinks to teeny size and summons all ants in the surrounding area to help. Ant-Man’s message is picked up by this timeline’s Ant-Man, who is still Hank Pym. He assembles a ‘60s-era Avengers team made up of him, Wasp, Thor, and Iron Man, to investigate. Back at the Baxter Building, Sue fights Alt-Sue, cutting off her oxygen with a force field. Franklin sees this and associates Alt-Sue as being more like the mother he remembers, so he stops the fight. Sue tries to reason with Franklin, saying she can free him from Malice’s psychic influence. It seems like it’s about to work, but then Franklin attacks Sue. Alt-Reed tries to break up their fight, only to be interrupted by Dark Raider teleporting into the room. After a few pages of Ben, Johnny, and Ant-Man fighting the Alt-FF and Alt-Avengers, we cut back to the Dark Raider. He proves himself a match for our heroes, freezing Alt-Reed so he can’t stretch and shattering Franklin’s psionic armor. The others put aside their differences and team up to fight the Dark Raider. They’re too late, though, because the Dark Raider fires an energy blast that flat-out kills Alt-Reed and Alt-Sue. He says his work is done and he teleports away. While Alt-Johnny is overcome with grief, Franklin wanders off and the rest of the FF return to their own timeline, leaving their counterparts in tragedy. 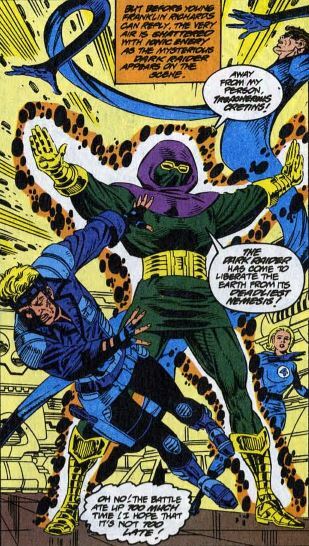 The issue ends with the Watcher saying the time has come for him to act. Fade out: Sue reaching out to Franklin shows how she’s changed since Malice left her. Rather than furiously denying he’s not her son, she instead tries to help him. Clobberin’ time: Assuming the FF are from the future, Alt-Ben tries to get stock tips from Ben, only for Ben to warn him to avoid insider trading. Flame on: Alt-Johnny’s fire burns out during the fight, leaving him powerless. This demonstrates how much more powerful Johnny has become since the FF’s early days. Fantastic fifth wheel: Ant-Man manages to defeat Alt-Ben by having ants crawl all over him, distracting him from the fight. Alt-Hank then wrests mental control of the ants away from “our” Ant-Man, who is Scott Long, revealing Hank to be the more powerful Ant-Man. Four and a half: I’m having trouble figuring out Franklin’s actions during the fight. First he’s out to get the FF, but then he almost accepts their help. I guess we’ll have to chalk this up to Malice’s evil influence. 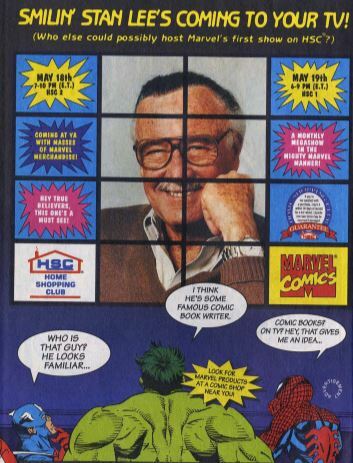 Commercial break: Has anyone ever seen Stan Lee’s Home Shopping Club show? I looked, but couldn’t find it on YouTube. 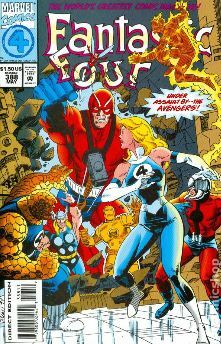 Trivia time: If we’re to assume the alternate timeline is following classic Marvel continuity, this takes place sometime around Avengers #2-3, when the Hulk left the team and the rest were looking for him, but before Captain America showed up in issue #4. That puts the Alt-FF sometime around Fantastic Four issues #22-23, where Sue got her force field powers for the first time. The Marvel Wiki lists this alternate timeline as Earth-43487, and this story is its only appearance. Fantastic or frightful? A lot of people on the internet want to interpret this issue as being a commentary on ‘90s comics, with classic ‘60s characters getting violently murdered. Having read ahead a little, I know this is just foreshadowing where this Dark Raider business is headed. Other than that, there’s not much to this issue. Just a lot of goofy fighting with an Avengers appears that amounts to very little. Next: Raiders of the lost Thing.